Crafted from our beautiful and luxurious organic cotton sateen, this quilt’s hand-stitched starbursts are plumped with organic cotton batting, so it’s cloud soft and extraordinarily comfortable. 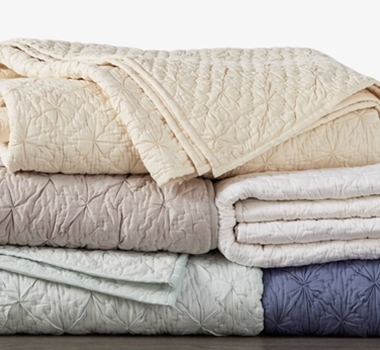 It can layer over a blanket or replace a duvet, offering year-round versatility. Stone washing lends the fabric extra softness and subtle color variation, making each quilt unique. The quilt and matching sham reverse to a diamond stitch and are finished with a simple knife-edge. 100% organic cotton is grown and woven in India. Machine washable. We recommend machine washing on the gentle or delicate cycle with like colors, with cold water and a natural, plant based laundry detergent. We do not recommend using whiteners, as bleaching agents may diminish the brilliance and depth of the colors; when needed, use only non-chlorine bleach. Line dry, or tumble dry low and remove promptly. Fabric softeners and dryer sheets reduce the absorbency of cotton textiles and are not recommended. Use a warm iron as needed.